Christmas lights: The lights in your room are not warm, glowy, happy lights. They are fluorescent. Bring some warm, glowy, happy lights-on-a-string and hang them up in your room. Every room I’ve seen with Christmas lights in it automatically seems more cheerful and better-decorated than rooms lit by dreary fluorescents. Pictures of friends and family: Going away to college means you will (probably) miss your family and friends back home. It’s always nice to have reminders that they exist apart from Skype and Facebook, so get a bulletin board or one of those weird ribbon-board things and put up a photo collage. Plus, you can edit your memories — if you had the Prom Date From Hell, by all means omit that picture of the awkward corsage-pinning. A flashlight: Skidmore, like the world, is not perfect. Things malfunction. Often these things are the lights. Blackouts and power outages aren’t uncommon here, so a flashlight is your best friend. You can also use a flashlight to hike into the North Woods (yes, real woods, not to be confused with Northwoods Apartments) and tell ghost stories. Your childhood stuffed animal: Don’t be ashamed. If you’ve got a Piggie or a Star Blankie or a Winky (yes, those are my friends’ names for their own stuffed animals) you will absolutely regret not bringing he/she/it to school. I’ve had Dog (he’s a dog) and Fuzzy (she’s a blanket) with me here at Skidmore since freshman year. I thought about leaving them behind when I was packing — “What if my roommate thinks I’m weird? What if everyone is all mature and sleeps with body pillows instead of stuffed animals? I’m a huge baby” — but ended up bringing them. I’m so happy I did. Both my roommates had brought their own too. Turns out being mature and loving your own personal Piggie are not mutually exclusive. 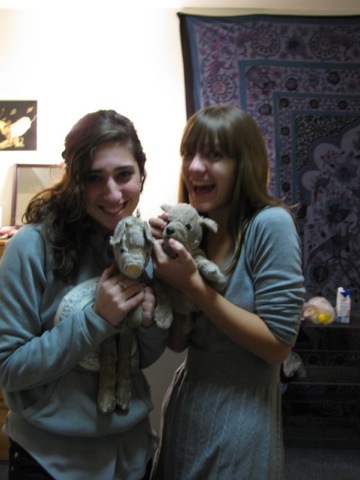 Hattie Young '12 (one of my housemates last year) and I say hello to our little friends. Winter items: Snow pants, winter coat, snow boots, plastic sled, whatever you have. If you’re from a warmer weather area, Saratoga Springs in the winter will knock your Humid Subtropical socks off. It’s cold and it snows, so be prepared. You never know when there will be a snow day or if you’ll end up joining Outing Club and going snowboarding at a nearby mountain. Brrr. Dinnerware: Plates, cups, a knife and fork and spoon. It doesn’t have to be fancy — actually, it really shouldn’t be fancy. College students break stuff. This is why we can’t have nice things. Just some plastic stuff from Target will do; it’s always nice to have a plate onto which you can dump your takeout lo mein. Fuzzy slippers: The dorm rooms have carpeted floors, but it can never hurt to bring cozy things. Bathrobes, Snuggies, extra blankets, and those squishy slipper-sock things also apply. DVDs/board games: Necessary for downtime — we’re busy bees at college, but sometimes an amount of time opens up that’s perfect for playing Apples to Apples (or Bananagrams, my favorite) or watching a movie. If you have Jenga or Battleship in your room, you’ll be the coolest kid in school. Planner/calendar: You don’t necessarily need to bring one to school. You can buy one at the Skid Shop if you wish. Just have something that can help you to plan your life, write down your classes and exam schedules and otherwise make sure you’re organized enough to deal with the logistical succubus that college often is. You don’t want to wake up one morning and discover that your a capella rehearsal and your neuroscience study group are at the exact same time on the exact same day. Alarm clock: In the same vein as the planner/calendar, this is for your academic benefit. Bring something that will wake you up in the morning. In fact, bring three different alarm clocks and put them in different parts of your abode. Your roommates will hate you when all three alarms go off, but if you’ve got an Intro to Psychology exam at 9 am and you stayed up ’til 4 am studying for it, you’re going to want as many alarm clocks as can fit in your room. Brrrring brrring! Beep beep beep beep!!! This entry was posted in Personal on October 23, 2011 by Molly O'Brien. Pingback: Molly at Skidmore › I was just accepted to Skidmore and cannot wait for the fall! What are five things that are absolutely necessary to bring for my dorm?